Does the lightest mass market disc-equipped frame live up to the hype? When Focus’s engineers set out to produce the Cayo Evo, this bike’s predecessor, they saw it as the more comfortable bike in the range, an alternative to the lightweight, race-oriented Izalco. They sent their plans to the factory, but to the amazement of the engineers the frame returned at a svelte 980g, lighter than the range-topping Izalco. It was a triumph of engineering over logic. And now, with the Cayo redesigned to accept disc brakes, the same thing has happened. 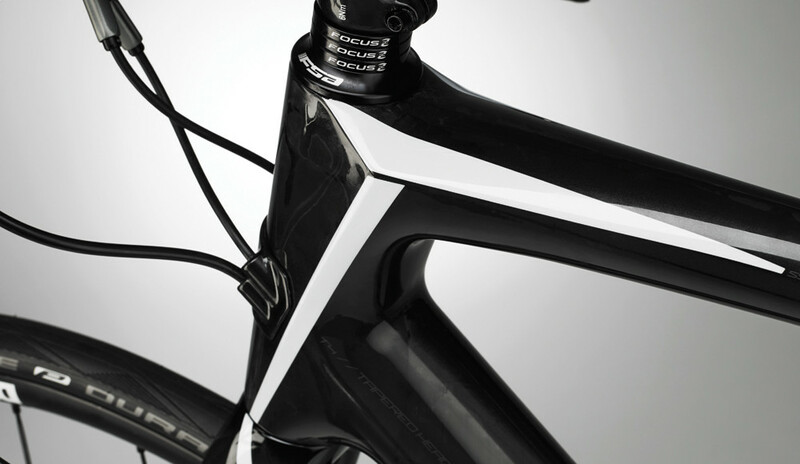 Grams have miraculously been trimmed and, at 880g, the Cayo is the lightest mass market disc-equipped frame available. The Focus Cayo Disc 3.0 is one of the most interesting bikes I’ve reviewed. 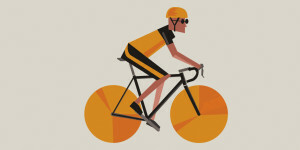 Disc brake-equipped road bikes are still in their infancy but I’m intrigued at the concept. Is it an approach suited to everyone? At this stage I’m unconvinced, but it’s clear that discs are here to stay. So get used to it. Among the Cyclist team, enthusiasm for disc brakes on road bikes is high. I, however, remain slightly sceptical. 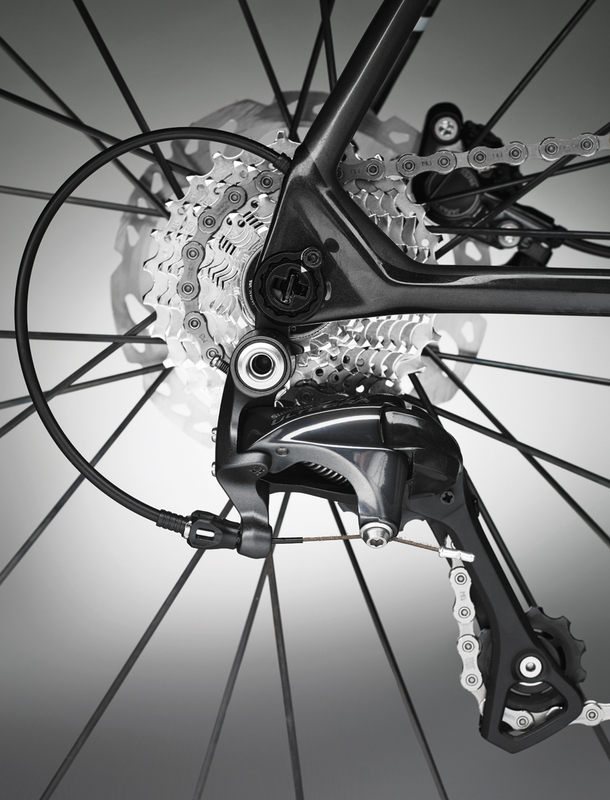 For me, the benefits of disc brakes are less obvious, and I’m not sure I’m ready to part with my own money on a disc-equipped bike until certain questions about standardisation have been answered. Will the standard be 140mm rotors or 160mm? How will the wheels be removed: quick releases or thru-axle? If it’s the latter, will their diameter be 12mm or 15mm? The industry has yet to agree, but the Focus Cayo has its own set of answers. Focus has opted for thru-axles, where the wheel axle itself slides through the centre of the hub and locks into the fork or frame with a fully enclosed 360° dropout. Focus claim greater rigidity and more precise positioning of the wheel in the frame, meaning the twisting forces on the wheel shouldn’t result in the disc brake rotor rubbing on the pads. As for the axle diameter, Focus has decided to go for a 12mm axle on the back, and a chunkier 15mm axle on the front to combat the extra twisting forces that occur at the front wheel. The thicker axle requires a wider dropout at the end of the fork, which has allowed Focus to use a continuous thread of carbon that runs down the fork and around the dropout, which wouldn’t be possible on the tighter angles involved with a narrower axle. The result is that it provides a very high tensile strength for a reduced amount of carbon and overall weight. Focus has taken a cautious stance when choosing the rotor diameter, opting for the larger 160mm. Bigger disc rotors offer greater stopping power and superior heat dissipation, but there is the downside of added weight (plus some people think big rotors look ugly on road bikes). Clearly, when it comes to the brakes, Focus has given this bike a lot of attention, however I feel there is potentially room for improvement across the industry’s disc-equipped stable. There just seems to be a lack of speed, which I desire. Disc brakes are still rarely seen at the racier end of the spectrum (thanks to UCI regulations), but are finding a niche with ‘sportive’ bikes such as the Specialized Roubaix, Giant Defy or Cannondale Synapse. The previous Cayo was presented as a sportive bike, but it was still spritely. The Cayo Evo was even used at the top level by Ag2r’s U23 team. On paper, the new frame should be even racier, thanks to its lighter, stiffer frame, but the introduction of discs seems to have limited some of the liveliness from the bike. During testing I felt the new Cayo 3.0 Disc had a weighty feel that wasn’t present with its non-disc predecessor. Setting off from a low speed there seems to be a slower response. Even up at cruising speed there’s a certain sense of resistance. I’m certain this fault does not lie with the frame, but rather with the heavily built wheelset. The DT Swiss R24 Spline wheelset is advertised at 1,775g for the pair, which is perfectly reasonable for entry-level wheels. But once the tyres and disc rotors are added, we weighed the rear at 1.8kg and the front at 1.37kg. To compare, a set of disc-equipped Fulcrum 5s (once specced for a Cayo at this price) weigh 1.56kg at the rear and 1.12kg at the front. Cumulatively, that makes for around half a kilo extra on the DT Swiss wheels, which is a noticeable chunk of weight and contributes to the high overall weight of 8.47kg for the full build. One of the original selling points of discs was the fact that wheels could be produced with greatly reduced weight at the rim. Without the need for a braking surface, the rim could do away with aluminium tracks or heavy heat-resistant resins at the outer edge, making for a faster spinning wheel. The reality, currently, is that low-end disc-specific wheels are being overbuilt to tolerate the big twisting forces coming from the hub, meaning potential weight savings are being lost. Of course, it’s still early days for the development of disc brake wheels and it’s a certainty that, given time, performance will go up while costs come down. But we don’t seem to be there yet. Aerodynamically, there’s also a debate around disc brakes, with some estimates suggesting as much as eight watts of power could be lost at certain wind angles. There’s no way to confirm such a penalty without a wind-tunnel, but it could have been a factor to the general lack of speed aboard the Cayo. When riding alone, I felt a kmh or two was being sacrificed, and in my usual groups I was working hard to keep up where normally I would cruise comfortably. But could the excellent braking performance make such sacrifices worthwhile? The Cayo 3.0 Disc did stop faster than previously, but it was the control, lighter lever pressure and consistency that left an impression. Rain or shine, the brakes worked unfalteringly. Discs mean when you begin to find yourself in a troubling situation on a descent or in a bunch, you remain in complete control where once you may have found yourself with white knuckles. Despite all that, I didn’t find myself braking any later into corners, but rather found the more tactile brakes gave me extra confidence when slowing. Speed remains the main currency of my cycling, and so I’m still longing for a package that can deliver truly improved braking without sacrificing watts. For the moment, I’m left wanting a little more. To make a comparison, when I first tried an electronic groupset it created a giddy excitement in me that distorted the potential negatives of weight gain and maintenance beyond recognition. So much so, that when I rode a Focus Cayo Evo with Di2, I liked it so much I bought one. The introduction of a set of disc brakes didn’t stir the same excitement. 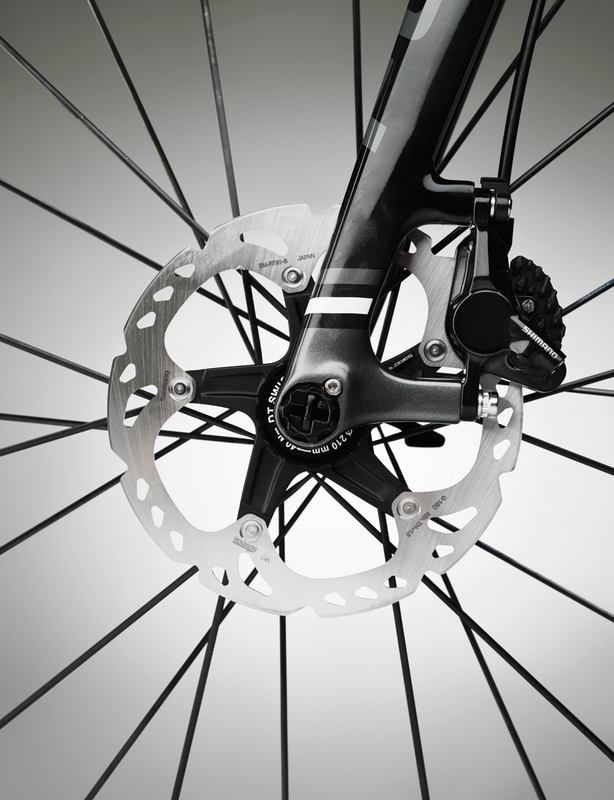 So for now, if I was standing in a bike shop with credit card in hand, I would be looking towards the top-end calliper brake Cayo ahead of this disc brake model. 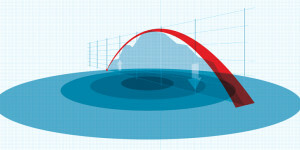 But if Focus continues to innovate with the technology surrounding discs, I remain open to being convinced of the system’s superiority in the future. Focus’s Rapid Axle Technology (RAT) could potentially lead the pack when it comes to devising a way to quickly remove disc brake wheels. The problem has been that conventional thru-axles need to be slowly unscrewed from the dropout thread and then pulled out. 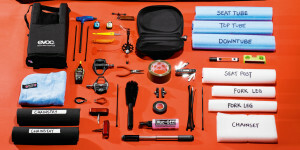 It’s far too costly in terms of time for the demands of the pro peloton. The RAT system requires you to push the axle into place, then rotate the lever 90° to engage the locking system. The system works with a T-shaped hook that turns and locks into a mechanism affixed to one of the non drive-side dropouts. It’s a little fiddlier than it looks, and it requires some practise to position the release lever in the right position when inserting the axles so the rotation provides enough tension to lock it in place. But despite the niggles, this is a very impressively engineered solution to one of the core problems for disc brakes on the road. 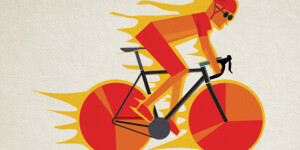 Does riding faster burn more calories?